On these pages are some answers to questions I've gotten about my playing and some of the exercises I use myself and with my students. Anything else you'd like to know? Just ask! For those in the Raleigh and Cary, North Carolina area, I have spaces available for drum/percussion students of all levels, and beginner and intermediate piano students. I am currently teaching lessons six days a week at two studios in Raleigh, and have times available at both. For more information or to set up a time, please email. Also, please read this essay describing my mission as a music teacher. to view the notation on some of the tutorials properly, you need to have the BACH font installed on your computer. It is available as shareware from here. For anyone who needs to write some music, but didn't make it to the store in time to buy some staff paper, (ahem...students...) here's two choices:small spacing, and large spacing. No excuses! One of the best tools for learning music is the metronome. One drawback of the metronome, however, is that you have to set the speeds manually - not good for gradually speeding up your tempo. Here are 3 MIDI files of a click track gradually speeding up over 100 measures. Use it for practicing rudiments, scales, or difficult passages. MIDI files will play in most audio player programs. Right-click to download to your computer. Searching for your perfect 3 minute rudiment? Here's a trainer metronome to help you out - count off at 40 bpm, one minute to get to 110, hold it for a minute, and one minute back down to 40. Lock it in and impress your friends (or contest judges). 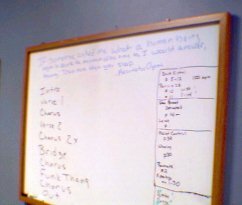 Speaking of rudiments, here's the rundown on everybody's favorite exercise (if you take lessons with me, that is!) - all 40 rudiments, in sequence, in tempo (80bpm), in context! If these tools have been useful to you, please consider leaving a tip! If you're looking for something else, let me know, and I'll do my best to add it! My alma-mater, AIM is an intensive school for musicians dedicated to "making it" in today's music industry. The staff at AIM are all top-notch professionals with successful careers, who also happen to be great educators! I know that studying at AIM made a major impact on my abilities, and I still draw on the skills I obtained there. The P.A.S. is an international organization dedicated to the art of percussion. Designed for performers, teachers, and students, the PAS supports the art of drumming through local chapters, newsletters, group insurance plans, and more. The private teaching studio of trombonist Christina Thompson and myself, where you too can learn to make the music happen! 2112 School of Musical Arts is a drum lesson facility located within 2112 Percussion in Raleigh, NC. There's a lot of good stuff going on, so if you're in the area, be sure to stop by for some lessons. You may even catch me teaching there if you stop in at the right time!